The room has an old world, cottage feel to it and radiates charm. There's so much to love and so many ideas to take note of in this happy space. I love the natural light. My eye is always drawn to the light in a room, probably because we have so little of it in our home. There are certain times during the day when the light streams in, but it's very limited. Others' natural light is what I tend to wish for more than anything else when I'm looking for inspiration on Instagram, Pinterest, or other blogs. And right down from the pretty window light are flowers in a pitcher. Flowers add instant glam. I don't really have a bush or blooms to cut from, but my high school has a courtyard that the agriculture class maintains. I clip from there every chance I get, and grocery flowers often come home with me. Collected items used in groups make a statement. Every now and then pull out part or even all of what you like to collect and let everyone else enjoy it too. 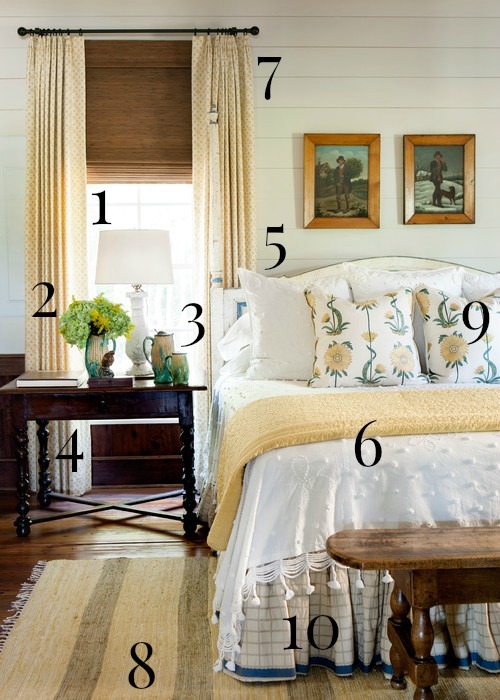 There's a lot of white in the room--bedding, walls, lamp--but it's not all white. 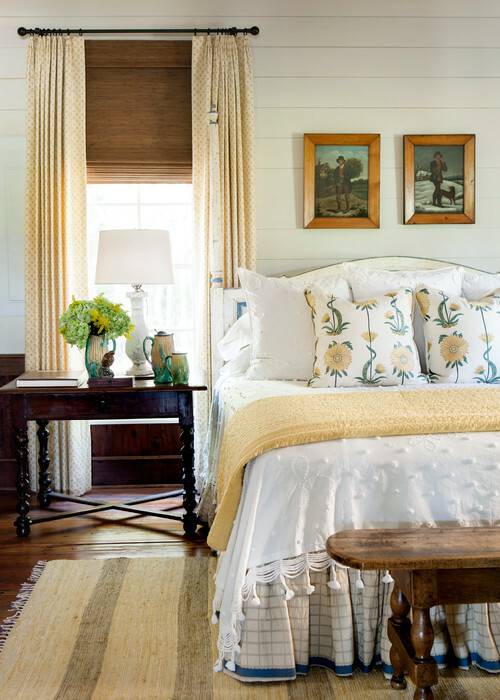 Just the right amount of color has been carefully mixed with the white to give it the charming cottage feel. The bedding is also a favorite. I like bedding that looks pieced together, a little here and there over time. And how about those pom poms on the bottom of the bed spread! I love the window treatments. They are reserved and understated. Simple panels over a natural blind is one of my favorite looks. The rug is also well-chosen. It doesn't scream "look at me." The stripes add interest and a touch of pattern. It nicely ties the space all together. Color: just enough and in just the right way--added by the accessories. The yellow tones aren't necessarily all the same, but they all blend well. It's been hard for me to break the habit of thinking everything must match exactly. But look how wonderful it looks when it doesn't. I'm trying! To me the room is elegant but not one bit stuffy. The charm seems to have been created effortlessly. 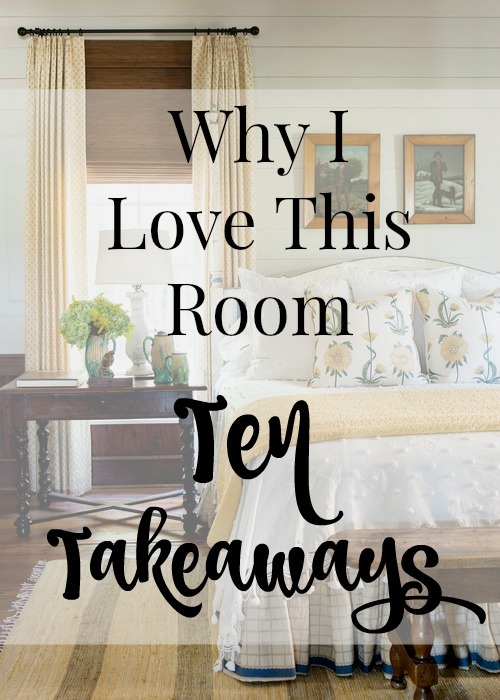 Hopefully you saw a few ideas you can steal borrow, too! I think Phoebe Howard's bedrooms are my favorite of any designer. They are always so peaceful and pretty! Gosh, I know. I just recently found her portfolio and it is wonderful!